Frankly we need many more stories and photos about your ideas about the best Main Street. The form at the end of this page lets visitors tell about why they like a particular thoroughfare, as well as examples of events, streetscape projects, techniques, attraction and retention methods, and clean-ups that provided the extra oomph that your most famous roadway needed to remain an activity magnet in the community. Perhaps your major street is great because it offers vibrant shopping or recreation, it accommodates every method of transportation graciously, it is wide and beautifully landscaped, or maybe this street is narrow and lined with wonderful historic buildings. Maybe you really did your homework about retail attraction, and have assembled an exquisite collection of businesses. Whether the function of the street is retail, office, service, residential, or all of the above, Main Street anchors downtown and provides a focal point for community pride. Almost everywhere in the U.S., it has been a struggle to keep every place on the main street (which might not be called Main Street, you know) occupied. Some other parts of the world are more successful. As retail tastes have changed, and big box stores sell a very large share of the goods that Americans purchase, your principal commercial thoroughfare has had to reinvent itself time and again to stay relevant, if your community is typical. 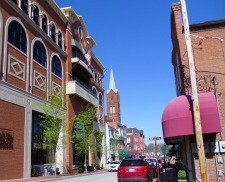 Places without a Main Street frequently try to create one, and success of these projects varies. Often they look fake because they are fake; real downtowns were built over years, not months. Although quality urban design features an overall pattern or motif, variation is essential as well to prevent monotony and boredom. Of course in many cities across the world, the historic heart of downtown continues to thrive. Tell the rest of us how you keep that area vital. Are economic development strategies based on Westernization and urbanization affecting your version of Main Street? If so, how? So let's see some of your nominations for great downtown efforts. Below you'll learn what some communities are doing. If we accept your text and up to four photos, the result is a new freestanding web page that you can use in social media. What's Your Favorite Main Street? What Main Street type of place (no matter what it's called) makes you want to visit over and over again? Describing your favorite downtown place--and what you think makes it tick--is easy. Type here. Your story will appear on its own Web page. We edit to correct spelling and make posts more concise. Since most people scan the Internet, include your best thoughts in your first paragraph. Click below to see complete contributions from other visitors to this page.